There are many DVD burners out there for Windows operating system. But there are only limited DVD Burners available for Mac OS X. So, Cisdem came up with DVD Burner software which will allow users to burn DVD on Mac with some personalised features like adding subtitles and menus for audio and video DVD. At Cisdem they build highly efficient Mac software that makes life easier and processes simpler. Support videos from any source, even directly from Camera, iPhone, iTunes, iMovie, etc. With a built-in video editor, you can rapidly perform basic video editing tasks, such as cropping, rotating, trimming, or adjust the brightness and contrast. You can also add special effects, watermarks and subtitles to your project. Create DVD from HD/SD Video include 3GP, 3G2, AVI, FLV, MP4, MKV, MPEG, VOB, WMV, AVCHD, DV, MOV, MOD, TOD, HD AVI, HD MPEG, HD WMV, HD MOV, etc. Wide variety of stylized templates for almost any theme: Classic, Nature, Holiday, Cartoon, Abstract, etc. Personalize with customizable frames, buttons, background photo & music and title names. 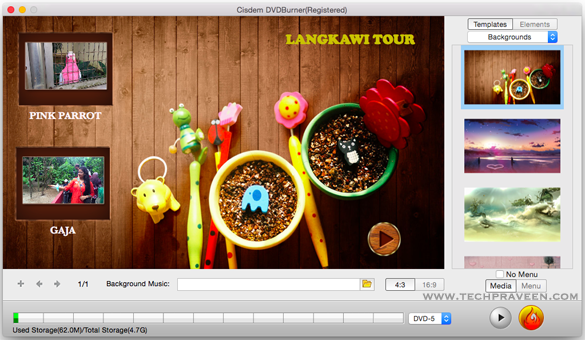 Cisdem DVDBurner enables you to burn DVDs and create ISO files with ease.Cisdem DVDBurner is a great tool that gives you a streamlined and straightforward DVD authoring and burning solution for your Mac. It supports video media from any hardware source such as a Camera, or an iPhone, or from software such as iTunes or iMovie, etc. You can pick and choose different menus for different occasions. Select any one of the preset menu and customize it to fit into the flavor of the occasion. You can customize it with different thumbnails, frames, buttons, and texts. You can select any video or clip from the video as the title thumbnail. As said earlier you can add subtitles to audio tracks. You can simply drag and drop the subtitles or audio tracks to tell your story better. Edit, Personalize, and enhance DVD. DVDBurner provides you the powerful tool rather than just burning the DVD. You can have the robust assortment of video editing features such as crop, rotate, and trim video files to remove letter boxing and special effects like watermarks. Cisdem provides you the option to preview the DVDs in real time. What you see is what you get; you can view the files while burning it just like you are seeing in DVD. With multi-core processing, multi-tasking DVD burning technology and multi threading, you will get 16x times faster result. All video files you put into Cisdem DVDBurner are re-encoded for standard movie discs and are playable on any DVD/BD player without compromising on video quality. There are no compatibility issues whatsoever. The appearance is pretty well-ordered and easy on the eye with themes that are colourful and interesting. All the features are very organized and the interface itself is amazingly user-friendly. Readers post your reviews after trying out this awesome software.